My teeth is honestly, quite yellow & has abit of stains. I reckon it's because I drink tea alot on the daily. (In case you didn't know, tea is more likely to stain your teeth than coffee due to it's higher tannin content.) There were also times where I strayed away from certain shades of lipsticks because it made my teeth look more yellow than it already was. Can you imagine my excitement when I was introduced to this Smart Teeth Whitening Kit from Smile Box? An average teeth whitening session at dental/aesthetic clinics could costs up to hundreds of dollars. 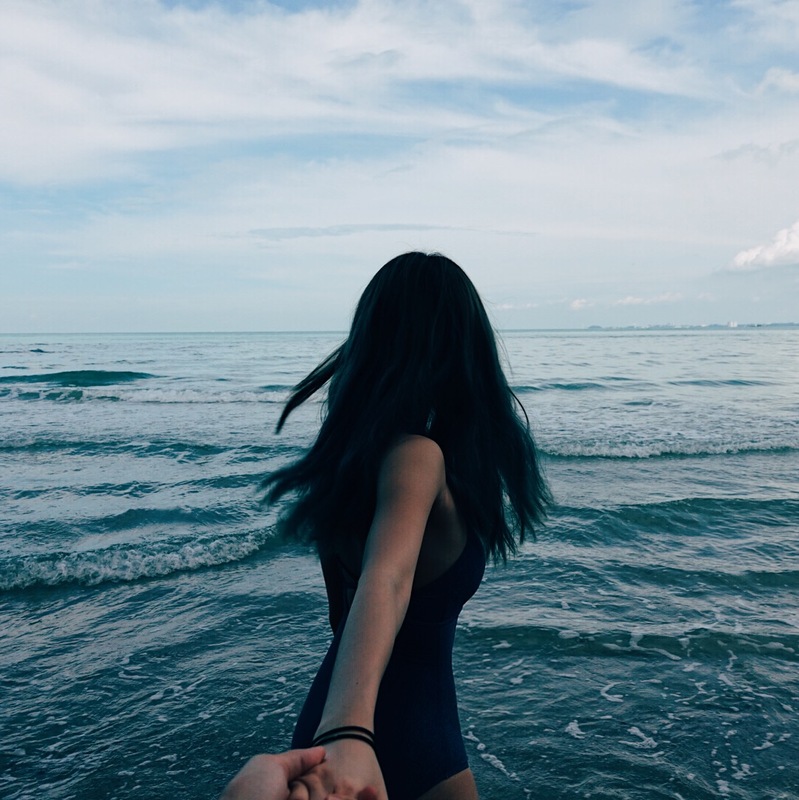 (Ok, just checked. It costs about 200$ avg for a teeth whitening session.) Now, at only $98.00 $78.00, you can now whiten your teeth in the comfort of your own home. Time to say goodbye to high dental costs! 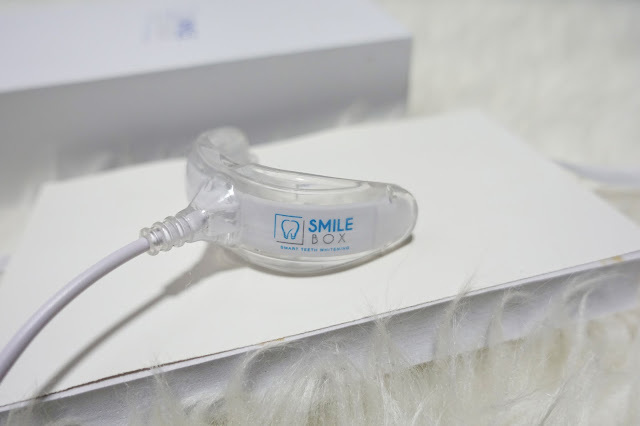 Smile Box device has 16 LED, with 2 types of lights available . Full blue ray for teeth whitening and red blue ray for sterilization and deodorization. Every LED bead has a fixed voltage of 5V, wave length is 480 nm and light intensity is 1.5w. 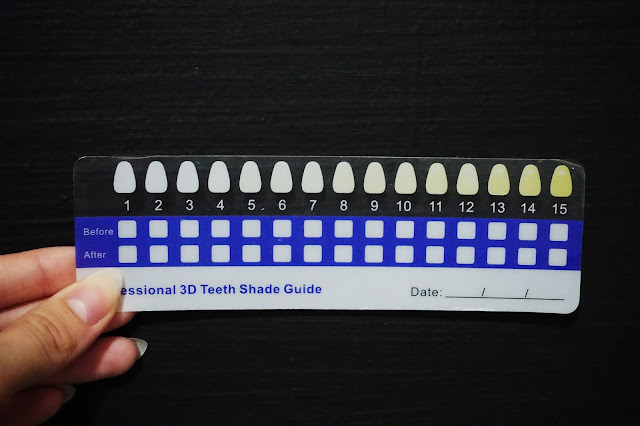 Every box comes with this 3D shade guide where you can compare your teeth shades to, and to monitor your process. The Smile Box Smart Teeth Whitening Kit is really easy and fuss-free to use. 2 - Connect Smile Box device to a power source. It could be anything, your phone (available for both samsung & iphone), powerbank, or even your laptop! 3 - Gently bite onto the LED lighted mouthpiece for 16 mins and viola! ** Smile Box is a local brand and NOT an MLM product. (apart from their already discounted price! 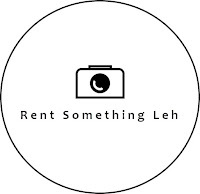 ), when you check out at Smile Box.